Teaching the Indian traditional Yoga, Nathalie Antony has been the direct disciple of sri O.P. 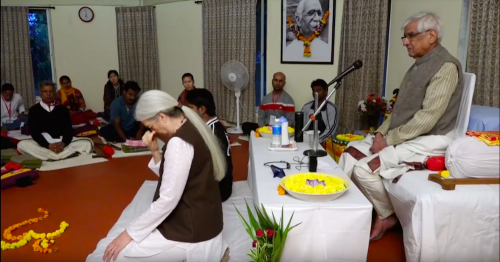 Tiwari at the KAIVALYADHAMA Institute, india. Now, she gives weekly lessons, training courses and summer workshop in south of farnce, Paris and india. She also devotes herself to the study of yogic tradition and practices, as well as transcribing teachings and translating texts. 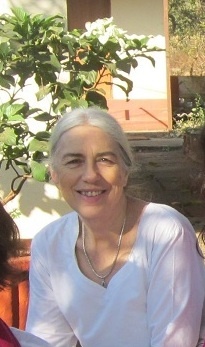 Nathalie ANTHONY belongs to the "INTERNATIONAL TEACHERS NETWORK OF KAIVALYADHAMA"
Nathalie has been teaching since 1982. She has a passionate interest in teaching and pedagogy. She devotes herself to the study of yogic tradition , as well as transcribing teachings and translating texts. the traditional and authentic knowledge of Yoga referring to the texts as Sri O.P. TIWARI of the KAIVALYADHAMA Lonavla Yoga Institute has passed it to her, along with the knowledgeable senior teachers and physicians of the Institute. Nathalie has always felt fundamentally interested in the human being, both in his behavioural reality as well as in his relationship to the Ultimate Reality. Yearlong she has committed herself to an in-depth study of the individual as a whole : mind, body and soul. In France for 18 years she very closely followed the teaching of Catherine ASHMORE with whom she still works. During her years of training for the "Yoga teaching aptitude degree" (Catherine ASHMORE School, 1983), she was lucky enough to also study with Jacques THIEBAULT. She equally did Chinese Energetic Studies with Jean-Louis BLARD (national degree in Traditional Acupuncture – 1986) and taught massage (certified Master Practician degree, "The Conscious Body" J.L. ABRASSART 1985). A study tour on Yoga and Ayurveda in India in 1989 was to have a lasting influence on her life, for it was there that she met Sri O.P. TIWARIJI and became his direct disciple. It is thanks to him that from then on she receives traditional Yoga knowledge, such as it is still passed on by a few masters in India. During this journey to India, she also met SHANTARAM VAIDYA (1911 - 2006) a reputed Ayurvedic doctor, who was to become her « grandfather » and initiated her in Indian culture. More recently, it is MIRA, whom she met at the Vedantic Centre of Gretz (near Paris), who very generouly shares her love of books and of India with her. She would like to thank all her teachers who have taught her all she knows and who have contributed to her growth.